Suriname’s President, Desi Bouterse (left) and the President of Guyana, David Granger at a joint news conference. Suriname’s President, Desi Bouterse and the President of Guyana, David Granger on Friday agreed to appoint a high-level representative who will conduct shuttle diplomacy to resolve several areas of concern. “We have agreed to a mechanism in which the different issues that will be brought up or have been brought up per sector can be discussed and that these will be implemented and monitored within a certain time-frame and then reported back,” Bouterse told a news conference through an interpreter. He explained that such a mechanism would be accompanied by a special envoy who would report back to the Presidents and work with the Joint Cooperation Council to find solutions to the problems. They said the structural mechanism would seek to implement agreements efficiently within a specific time-frame. 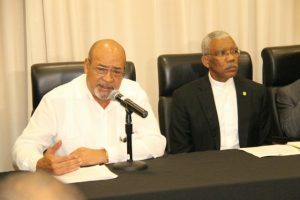 “That is the most important outcome of the meeting that we have agreed on a method of moving forward into the future to ensure that problems are solved, it is not a talk-shop,” Granger said. The Guyanese leader said economic issues, mainly those having to do with hassle-free movement of Guyanese minibus operators and access to Surinamese airports by Guyanese airlines- would be taken to a Cooperation Council for speedy resolution. Already, the two leaders agreed that Guyana’s concerns would be taken back to Paramaribo with a view to having them resolved. Bouterse said agreements on the environment, tourism, oil exploration and investments reached with Granger at their first round of talks six months ago in Nieuw Nickerie, Suriname six months ago have not yielded much fruit. “We are about half a year further, six months further and if we look back we are not satisfied with what has been done with these issues so that’s not good and that’s why we would take these as an example,” the Surinamese President said. Meanwhile, President Bouterse said China, European Union and Brazil have all expressed an interest in funding the construction of a bridge across the Corentyne River. He said Guyana would first have to agree on where the western end of the bridge would be located. “Fortunately, there is no conflict existing between Suriname and Guyana about the bridge,” he said. In 2013, Suriname and China Railway construction signed a memorandum of understanding to build the bridge and Guyana granted its no-objection.